Azusa Pacific University is a community of individuals representing diverse Christian backgrounds, yet at its core is an identity built on the Wesleyan Holiness tradition. We invite you to learn more about this rich tradition and how it shapes who we are as a university community—dedicated to engaging all people with compassion, grace, and humility as we reflect the love of Jesus Christ. Imagine a great river system—always moving, changing, and bringing life. This is the river of God into which many streams flow, feeding and being fed by the river, causing God’s work in the world to be diverse and full. There is no facet of human life that remains unchanged by the life-giving river. When the people of God immerse themselves in its flow, they become the reflection of God throughout the world. As a result, lives are restored, systems are redeemed, and all of creation is made new. Many streams comprise the river of God, all contributing movement, breadth, and depth to the larger river—the Church. Each stream brings uniqueness and diversity to the river system, representing a variety of traditions and stories coming together in unity to make up the whole. 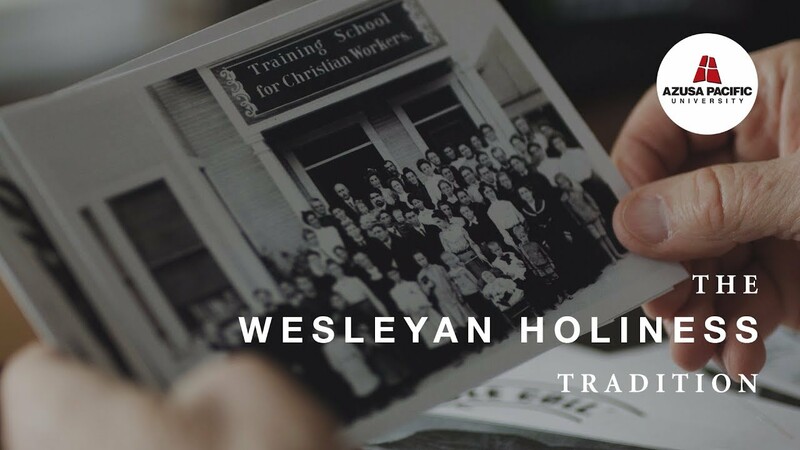 Among the interwoven network of streams that form God’s river system is the Wesleyan Holiness tradition, in which Azusa Pacific University was formed and continues to thrive. It is a faith tradition rich with history, deep thinking, and powerful manifestations of God’s work in bringing relevant change to people and culture. We trace our heritage from the early church to the Roman Catholic, Anglican, and Methodist movements. More recently, our Wesleyan theology found expression in an emphasis on righteous living and social engagement in the Holiness movement. The denominations in the Holiness movement were founded by people in love with Jesus and full of the passion of God’s Holy Spirit. They launched initiatives that made a difference in the cultural issues of their day. Catherine and William Booth’s heart for righteousness overflowed to reach the streets of London; B.T. Roberts, Orange Scott, and others were driven to engage the political and cultural issues of slavery and discrimination, while raising the standard of personal holiness; George Fox, Phineas Bresee, D.S. Warner, Phoebe Palmer, Aimee Semple McPherson and others were consumed by the need for inner piety and full salvation through Jesus. The ongoing influence of this stream continues to be lived out today at Azusa Pacific University as we reach outward into our community and the world, following the model of Christ so that, by glorifying Him, God’s river will bring life.